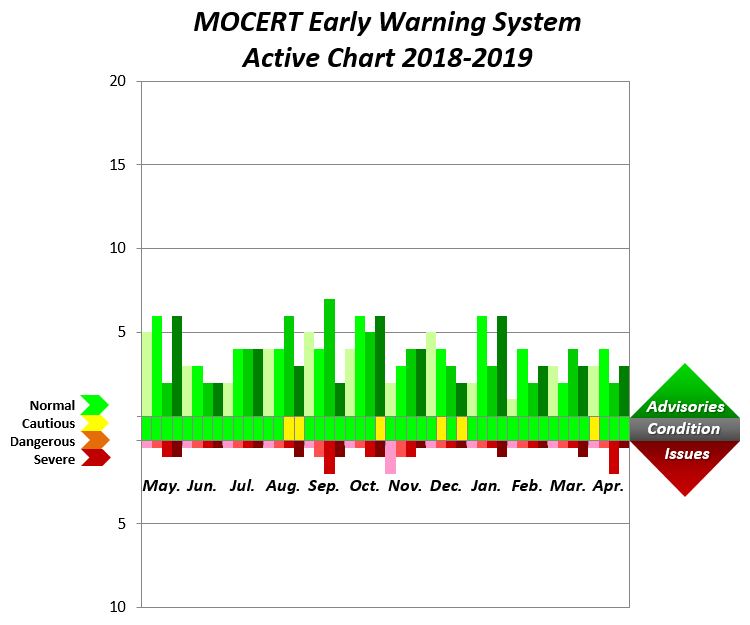 In the past twelve (12) months from May 2018 till April 2019 inclusive, there has been an “average” activity of just above four (4) advisories and just above one (1) issue per week, as collected by the Early Warning System function of MOCERT. The Internet threat signal has been raised six (6) times over the course of May 2018 till April 2019 to YELLOW-CAUTIOUS level, requesting computer users to be cautious about the websites and files they access from the Internet. April, 2019. The threat level has been raised to "Cautious” in the first week of April. Two 0-day vulnerabilities were reported in Microsoft Edge and IE Browsers with publicly-available PoCs. Microsoft released regular patch, Oracle published its quarterly Critical Patch Updates, and Adobe patched eight products this month. March, 2019, "Normal" Level. Microsoft released regular patch update. Apple and Adobe also released several security updates this month. There were no significant events that warranted a raising of the signal. January 2019, “Normal” Level. Oracle released quarterly critical patch updates which contains 284 new security fixes. Adobe released security updates for Adobe Flash Player, Adobe Digital Editions, Adobe Connect, Adobe Acrobat and Reader, and Adobe Experience Manager. Apple and Microsoft released their regular patch update as usual. December 2018, "Cautious” Level. Microsoft's regular patch updates this month included a zero-day in the Windows Kernel reported as being actively exploited in the wild. Adobe also released patches for multiple vulnerabilities in Acrobat and Reader and one critical zero-day vulnerability in Flash Player. A critical SQLite flaw disclosed affected millions of Apps. phpMyAdmin also released critical software update to fix multiple vulnerabilities. November 2018, “Normal” Level. A normal amount of patches to vulnerabilities were reported this month. Although zero-day vulnerabilities in Microsoft Edege and Oracle VirtualBox were uncovered and their exploits or proof-of-concept (PoC) were publicly disclosed in this month, there was no report of the vulnerabilities being exploited in the wild. The signal for this month stayed "Normal" GREEN signal. October, 2018, “Cautious” Level. Oracle published Critical Patch Updates which contains 301 new security fixes while Adobe, Apple, and Microsoft released regular patch updates. An 0-day passcode bypass vulnerability with PoC was reported in iOS12 in iPhone, but only attacker with physical access to devices could exploit it. At the end of October, another Windows 0-day vulnerability with PoC was also disclosed affecting Windows 10 and recent versions of Windows severs editions. The Windows 0-day has left all Windows users vulnerable to the hackers until the next month's security Patch Tuesday. September 2018, “Normal” Level. Microsoft, Apple, and Adobe released regular patch update as usual. Although a set of 0-days were uncovered in this month, there was no report of the vulnerabilities being exploited in the wild. The signal for this month stayed "Normal" GREEN signal. August 2018, “Cautious” Level. Adobe security updates came out more often this month. Microsoft released its regular patch update as usual. From the week 24th of August, the threat level was raised to "Cautious" owing to disclosure of a new critical vulnerability in Apache Struts and an 0-day Microsoft Windows Task Scheduler vulnerability. July 2018, “Normal” Level. Oracle released quarterly critical patch updates which contains 334 new security fixes. Adobe released security updates for Adobe Flash Player, Adobe Experience Manager, Adobe Connect, and Adobe Acrobat and Reader. Apple and Microsoft released their regular patch update as usual. May 2018, “Normal” Level. A relatively normal amount of patches to vulnerabilities were reported this month. Two 0-days(EFail and JScript Error Object Use-After-Free) were uncovered this month, but there was no report of the vulnerabilities being exploited in the wild.